Heat oven to 350 I doubled this recipe and used a 9x13 pan. powder. Place half of the batter in your pan and half of the streusel topping, add remaining batter on top and finish with streusel topping bake for about 30 min until toothpick comes out clean. for breakfast with that hot coffee...Yummy! Yum!!! Super moist and I loved how the streusel was dispersed through the cake. I'm so glad you enjoyed the cake! Wow that looks amazing! What are shortening sticks? Thanks! They are just shortening that come in convenient sticks instead of measuring them out, reminds me of butter that come in stick form. You can use any type of shortening you choose. :) I hope this helps. Just made this. Wasn't sure it would turn out because the batter was really thick but it was perfect and delicious! No one in the family believed it was gluten free. This one's a keeper. Thanks! I've used this recipe several times (I use Better Batter and Spectrum shortening), and it's great every time! No one knows it's gluten and dairy free either, which is a plus when entertaining (I'm the only one in my family with food sensitivities). Thank you! 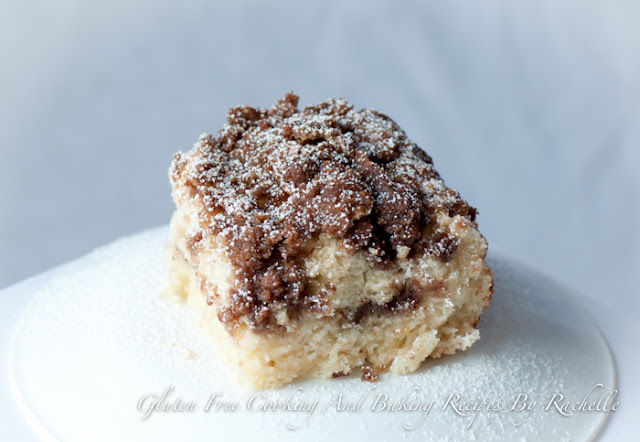 ©Gluten Free Cooking And Baking Recipes by Rachelle 2012-2014 All Rights Reserved. . Simple theme. Theme images by gaffera. Powered by Blogger.